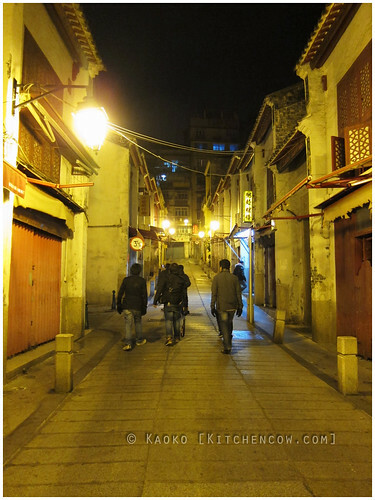 One thing that must be enjoyed when staying in downtown Macau is exploring the streets by night. After 9pm, most of the stores are closed, so you’re left with deserted streets, dingy yellowed street lights, and a feeling that you’ve entered a world where time has stopped. It’s a novel experience, walking down the streets, taking photos, and soaking up the atmosphere. Of course, after exploring, one can get hungry. It seems like a simple enough problem but remember what I said about the shops all being closed? Placed in that situation, we counted ourselves lucky when we stumbled upon a small restaurant connected to a small hotel. It was called Restaurante Hong Thai, connected to the Hotel Hong Thai. Quickly rushing in from the wintery cold, we faced another problem when we realized that the server spoke no English! Instead, she led us to a wall that featured photos of the food they serve. Surprisingly, the dishes were mostly Thai—something we weren’t expecting from a small hole-in-the-wall along the sidestreets of Macau. It was more hole-in-the-wall rather than hotel resto. Notice my messy tray? 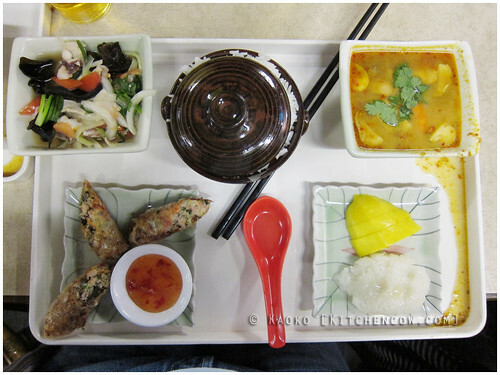 Although the selection was limited to Thai dishes, there was enough to choose from and the prices were cheap. I opted for a set meal that featured Tom Yum Goong, a spicy, vinegar-based seafood salad, fried spring rolls, rice, and sticky rice with mango. 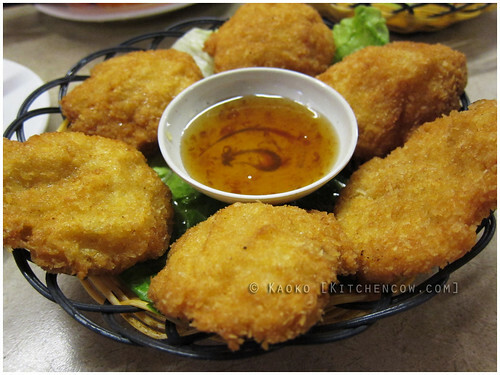 A prawn croquette dish. Portuguese, mebbe? On a cold evening like that, it was a wonderful choice, with the physical heat and the spiciness of the soup satisfying my insides. The side salad was interesting, offering interesting textures from the various vegetables, squid tentacles and wood ear mushrooms. 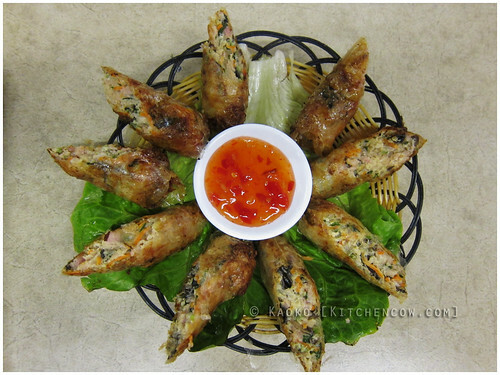 The spring rolls were crisp and flavorful, managing to stay light despite being deep fried. 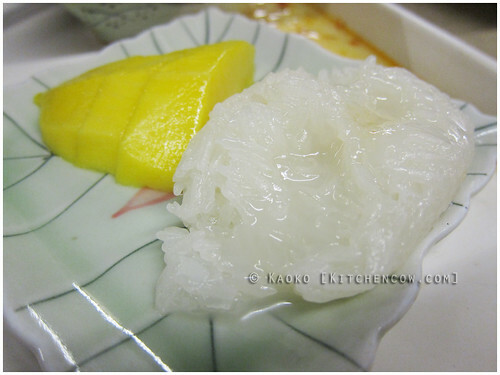 The sticky rice was a welcome way to end the meal, fragrant with coconut milk and going well with the tangy mango slices. While the restaurant was plain and the food, though delicious, was simple fare, we easily agreed that it was a good meal. Sure, it doesn’t compare to the luxurious spreads we encountered at the other restaurants we ate at. But it was definitely a memorable meal. They say nothing seasons food better than hunger. I beg to disagree. Hunger is a good seasoning, yes, but an even better flavor enhancer is the company of friends amidst the late night magic of downtown Macau.